Is your forehead trying to say something to you? Just take a close look at it and you will understand how you have been ignoring this part of your face lately. Can you see fine lines developed across your forehead? Or, maybe they have already grown into deeper wrinkles and you never had time to notice it. Whatever the situation is, it is time for you to stop this sign of aging from getting more prominent and becoming permanent eventually. Thinking how to do it? We are here to guide you through the procedure. Let us talk about forehead wrinkles or ‘furrow lines’, the best practices to get rid of them, and the most effective natural remedies to keep them away. Why Do You Get Forehead Wrinkles? We all want to delay the process of aging as much as possible. But it is not always easy to suppress those visible signs like wrinkles, fine lines, etc. on the forehead, at the corners of the eyes, and around the lips. Forehead wrinkles are considered as the toughest ones to combat among them. While often seen as a sign of mellowness, they are actually the outcomes of the reduced production of collagen in the body. As a person ages, his/her skin loses its elasticity and becomes less firm, which results in wrinkles and sagging. However, there is no specific age for forehead wrinkles to appear. If you do not take proper care of your skin both externally and internally, you may end up getting them as early as in your twenties. There is also no single reason behind their appearance. Rather, a number of factors can work together on the occipitofrontalis muscles of your forehead and give you annoying horizontal lines. Some of the most common causes of forehead wrinkles are aging, excessive frowning, unhealthy diet, less water intake, smoking and drinking, too much sun exposure, depression, stress, and even genetics. Making some good changes to your diet and lifestyle practices can help you alleviate or even do away with your forehead wrinkles. Follow these religiously and you will notice the difference in less than a month’s time. A balanced diet is a panacea for almost all skin issues including forehead wrinkles. The right diet comprising adequate amounts of vitamins, minerals, proteins, carbohydrates, and healthy fats goes a long way in retaining skin texture, thereby curbing forehead wrinkles effectively. Eat lots of green veggies and fresh fruits with a very high water content that will make your skin less prone to wrinkles while cutting down your calorie intake. Also, consume lots of beta-carotene, which is naturally found in yellow, orange, and red foods, such as bell peppers, sweet potatoes, mangoes, carrots, and tomatoes. 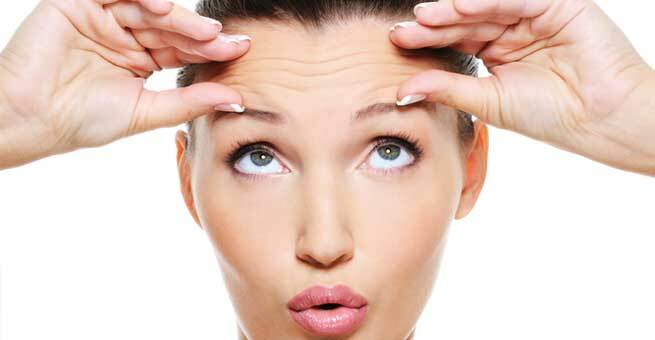 Forehead wrinkles become more pronounced when you do not hydrate your skin adequately. If your skin is naturally dry, the chances are high that you will develop more forehead wrinkles than others with less dry skin. Hence, drink 8-10 glasses of water daily to maintain the health, firmness, and youthful glow of your skin. When it comes to preventing the formation of signs of premature aging on your forehead, moisturizing the skin profusely becomes essential. Use a high-quality moisturizer, preferably one containing hyaluronic acid that aids in water retention. Organic lotions containing extracts of aloe vera, vegetables, or fruits are also great sources of moisture for the skin. You can even try anti-wrinkle moisturizers that are rich in potent firming ingredients. Those furrow lines on your forehead can be the results of stress, anxiety, and depression in your everyday life. Hence, stay away from such daily exhaustion as much as possible in order to steer clear of those unwanted signs of aging. Getting enough sleep every day is very much necessary to avoid forehead wrinkles from appearing. It is even better to sleep with the humidifier on if you live in a dry climate as it will help you retain your skin moisture and revitalize your skin at the same time. Massage the wrinkles out of your forehead gently with your fingertips by using any natural oil of your choice. This will relax your facial muscles and enhance blood flow to your facial tissues. A few drops of warm olive oil or organic coconut oil works wonder for this purpose. Mixing these two in equal amounts will give you even better results. You can also opt for sweet almond oil, jojoba oil, or castor oil. All of them are capable of hydrating, conditioning, and rejuvenating the skin, thereby keeping wrinkles at bay. Practice it every night before hitting the sack and follow an upward motion for 5-10 minutes to ensure that the oil gets absorbed by the skin completely. Dilute 1 teaspoon of fresh lemon or orange juice with 1 teaspoon of water and apply the mixture to your forehead wrinkles with the help of a cotton ball. Once it dries, rinse with tepid water. You can also combine some rose water with the pulp or ground skin of citrus fruits and use it as a wrinkle-busting pack. Soak a clean washcloth in warm water, squeeze the excess water out of it, and spread it over your wrinkled forehead. Remove it after a couple of minutes and apply 2 tablespoons of manuka honey in a thin layer. Let it sit for 20-30 minutes and then, wash off with lukewarm water. Doing this once every day will keep your forehead, smooth, healthy, and young-looking. Petroleum jelly is highly effective in eliminating wrinkles and fine lines from the forehead. You can always use your go-to petroleum jelly for this purpose. Just make sure that it is pure and does not contain harmful chemicals.